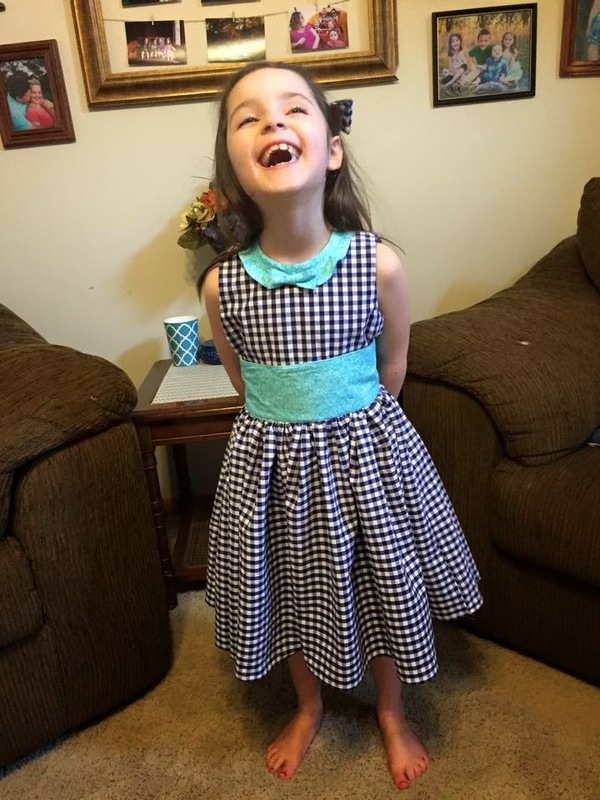 For my second stashbuster, I made a deliciously twirly sundress for Holly, who is six years old and in kindergarten. The fabric: navy and white slubby cotton gingham found on the clearance table at Hancock Fabric's for a dollar a yard (a DOLLAR!). I bought eight yards, so this one will be reappearing over the spring or summer. Trim fabric is a blender cotton I found at a local quilt shop. It was not a bargain, but you can't always cheap out. I like to support local businesses any time I can, and it was fun to chat with the lovely lady who cut it for me. It evened out with the practically nothing paid for the main fabric, anyway. The pattern: It's a bit of a mashup. The main dress pattern is Chloe by Violette Field Threads - available here. The collar is from the Piper dress pattern, also by Violette Field Threads, available here, which is one of my very favorite little girl dress patterns on its own. I've made it five times now, and have plans to make several more. I used the size 6, which is what she wears in ready-to-wear clothing. I did not make the Chloe dress exactly according to the directions. The original design uses tulle, chiffon, and netting for a big, glamorous, poofy skirt and does not feature a collar. I was going for something more casual and play-appropriate, so I made the skirt out of a single layer of cotton woven instead. I added the collar because I wanted to tie in the teal with more than just the sash, and because I am obsessed with bias trim lately, and wanted a way to add some. Any time you put patterns together without enough planning, there are risks. If I were to do this again, I would copy the neckline from the Piper dress on the Chloe bodice, rather than leaving it as-is. The collar doesn't lay down quite as well as I wanted it to. It's still cute, but not exactly right. Certainly wearable, though. I added the bow because it was still missing something when it was done. I made a pretty little matching hairbow, too, from this free tutorial. To modify it for fabric instead of felt, I cut out the pattern pieces with at 1/4 inch added seam allowance. I cut two of each, sewed right sides together, and turned and topstitched. Then I put it together exactly as instructed and hot-glued it to a barrette. Super cute. Holly told me that she would have made the bow teal and the center of it gingham, but that my way was acceptable, too. She loves the dress. She said it rubs a little at the armholes and the waistline, but when she said it, she had been wearing the dress for two days, including having insisted upon sleeping it it. I think that assessment can be taken with a grain of salt.